There are two traditional options for racing game controllers: a gamepad and a wheel. The HKS Racing Controller is somewhere in the middle. But does that mean it's middle of the road? What's in the box: Controller, instructions. 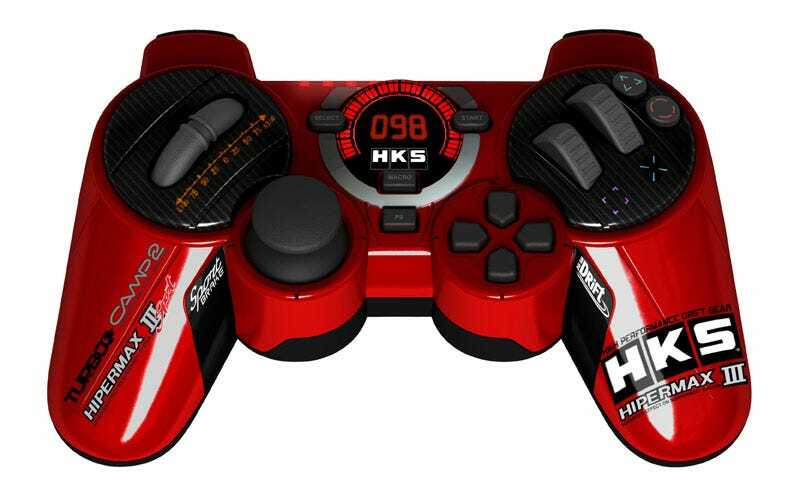 California-based peripheral maker Eagle3 hooked up with 37-year-old Japanese racing company HKS to create the HKS Racing Controller. The branding might be HKS, but the tech and design are Eagle3's. The controller is for the PS3 and the same size as a DualShock 3. But unlike traditional controller face buttons, the HKS Racing Controller has two protruding buttons (X and the square button). In place of the DualShock's directional pad, there is a "thumb steering wheel". There is a directional pad where the DualShock's right thumbstick should be. On the back of the controller, there are two default settings for the HKS Racing Controller: GT and NFS. "GT" refers to traditional Gran Turismo-style controls in which the X button is throttle, and the square button is the brakes. "NFS" stands for Need for Speed, and switching to this setting enables players to use NSF controls with the R2 and L2 triggers for gas and the brakes. There is a "macro" button that allows players to customize the controls. The thumb steering wheel is used to control the car while driving, but the thumbstick can be used, too. There is another switch on the back that can toggle back between the left thumbstick and the right directional pad for joystick control. Note: the controller is wired, so obviously, players must plug the controller in. The controller's red top coating is pleasant enough, and the HKS branding gives it a racing flair. The controller's back is covered in a high-quality plastic that is soft to the touch, but sturdy. While the DualShock 3 plastic might become clammy after extended play, the HKS Racing Controller remains dry. Other flourishes might be cosmetic only and won't be of use during play, but are nice touches. Under the thumb steering wheel, there are degree markers that let players know how far to the right or left they are going. In the middle of the controller, there is a digital number gauge that lets players know how hard they are pressing on the gas. What does come into play are the thumb steering wheel and the new X and square buttons. After a brief adjustment period, the controller felt natural — far more natural than pressing on flat face buttons and moving around a directional pad. What the HKS Racing Controller does so well is allow gamers to hit the in-between points that a racing wheel can, but a controller has difficulty with. The traditional directional pad always leaves me feeling like turning inch-by-inch, instead of gracing into a turn smoothly. The HKS Racing Controller replicates the turning feeling of a steering wheel, as opposed to the side shuffle of a button. And the ability to use both the thumb steering wheel and the thumbstick offered more freedom in how I approached corners and tracks. I found it easier to maintain my racing line in Gran Turismo 5 and draft as well, because the buttons were precise. Moreover, the force feedback combined with pressing down on the pedal style buttons was far more immersive than I thought it would be. There is slight resistance in the pedals so, like in a real car, it is necessary to push to make the pedals go down. However, my hands didn't feel any more tired than they would after playing with a regular pad, and the pedal resistance made things like easing up on the gas and pumping the breaks feel more natural, more like driving. It's wired. I haven't played a video game using a wired controller in a long, long time. This is not a deal-breaker in the least, and Eagle3 give players plenty of cord (over 9.5 feet) to play with. So I never felt chained down while using the controller, I was just slightly disappointed. But perhaps that says more about me than the HKS. Traditional controllers are very black and white: you go, you stop. That's it. But driving requires a mastery of the gray area, between fast and slow, between moving and stopping. Racing wheels offer that precision, but traditional controllers often feel as though they come up short. The HKS Racing Controller is a logical solution for those who don't have a racing wheel, but want a racing wheel experience in a control pad. The HKS Controller was released by Eagle3 in November 24, 2010. Currently priced at $49.99. A unit was provided to Kotaku for reviewing purposes. Played Gran Turismo 5 and Burnout Paradise extensively.